Anzac Day seems a good opportunity for reflection. A week or so back I was gearing up to post about the coming season of jazz festivals in Melbourne and the need for us to get off our couches and venture into the wintry nights to hear live music, prodded or encouraged perhaps by a surge in publicity about the delights of improvised music. 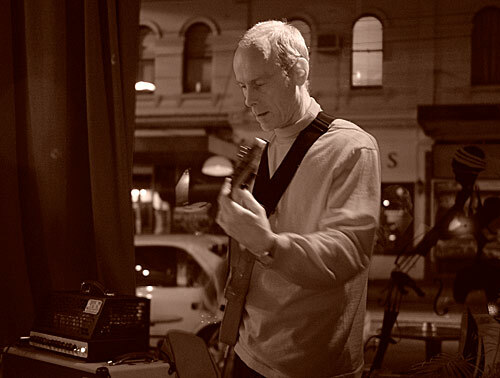 I reckoned that the first cab off the rank — before Stonnington Jazz (May 17 to 27) and the Melbourne International Jazz Festival (June 1 to 11) — would be the Melbourne Jazz Fringe Festival. 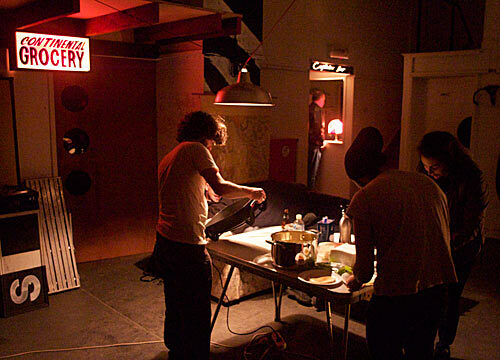 Fond memories of Fringe: A man called Miles makes pancakes on an electric frypan while a patron of the Captain's Bar requests a libation. Fond thoughts came to mind about favourite Fringe moments … the sausage sizzle at Fitzroy Bowling Club where your snag is handed over by one of your favourite musicians; the ache in the bum that you notice only at the end of Big Arse Sunday when you’ve listened to eight hours or so of music; the challenge of staying in the room long enough to appreciate the subtleties of what seems like noise; the growing sense of anticipation and excitement as the APRA Commission work by Fran Swinn, Gian Slater, Erik Griswold or Ren Walters is about to unfold; the fun of following fellow patrons through city streets from a performance in an art gallery to another in which a violinist appears on a balcony and an orchestra of laptops plays below; the adventure of heading along a dark light industrial street to a dimly lit warehouse where a man called Miles makes pancakes on an electric frypan, the tiny Captain’s Bar serves enticing libations and there’s an iPhone mash-up making “music” at night’s end; the thrill of discovering Sandy Evans playing in a band that sets the pulse racing … Need I go on? Anyone who has been at these gigs will identify with the vibe. 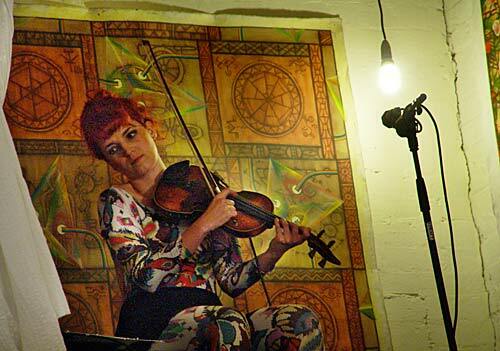 Fond memories of Fringe: Zani Kolac plays violin from city gallery balcony. With these thoughts in my head I was gently salivating as I looked up my calendar and saw the listing, gleaned from a useful jazz gig guide, showing that MJFF would run from April 23 to May 2, 2012. Then it dawned on my feeble brain that there had been no mention of the program for this year’s Fringe. A word with drummer and festival administrator Sonja Horbelt revealed there was reason for concern. Sonja said Fringe is “re-evaluating and quite sponsorless this year”. “Over the past year in particular we’ve felt the impact of Melbourne being “festival-ed out” and of the Melbourne Jazz festival drifting closer to what we believe to be the intrinsic identity of the Jazz Fringe Festival. It is flattering to think the main festival is drifting closer to what the Fringe is, but on the other hand it has left us searching for a definition of Fringe and a more focused purpose for the festival,” Sonja said. The news that the Commission concert would go ahead was good. The rest was a disappointment, not only because there would be less of the adventurous music for which this festival is known, but because there would be, essentially, no MJFF this year. 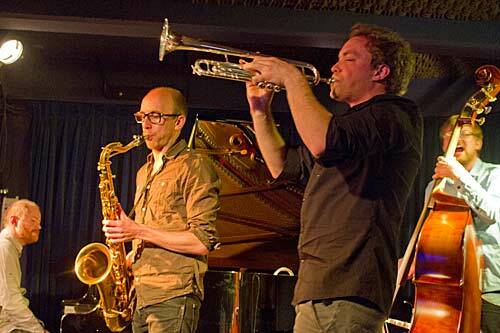 I lament the loss of sponsorship and I lament the loss of a much-loved and vital part of Melbourne’s jazz and improvised music scene. The irony is that Sophie Brous, who expanded Melbourne’s international festival into areas that had been Fringe territory, is no longer at the helm of MIJF, so in a year that could have seen Fringe filling in where the popular multi-stage experimental extravaganzas at Melbourne Town Hall left off — albeit on a necessarily smaller scale due to budget constraints — there is just one event rather than a full-on festival. I am not saying the Fringe organising committee had any choice. Nor do I think it is a bad thing for the MJFF to re-evaluate its purpose. But I am hoping that this vital and valuable festival emerges phoenix-like from the ashes in 2013, because it is worth far more than just a collection of gigs on a calendar. MJFF can provide the special, quirky experiences mentioned above, which more formal festivals may not find so easy. It is surely also the ideal place for emerging exponents of new approaches to music to try them on audiences willing to be shocked, even horrified, but often exhilarated. And established artists can try new line-ups or alternative approaches. That’s about it for the rant. The message: Keep the fringe in Melbourne jazz in the years ahead. May sponsors everywhere — apart from APRA, extempore, Melbourne Jazz Cooperative and Northcote Town Hall — hear and heed that message. Tilman Robinson, composition/trombone/processing; Peter Knight, trumpet/processing; Callum G’Froerer, trumpet; Xani Kolac, violin; Melanie Robinson, cello; Brett Thompson, guitar/banjo; Berish Bilander, piano/accordion; Samuel Pankhurst, double bass; and Hugh Harvey, drums. Robinson’s new work is inspired by Italo Calvino’s 1979 postmodern novel of that name. 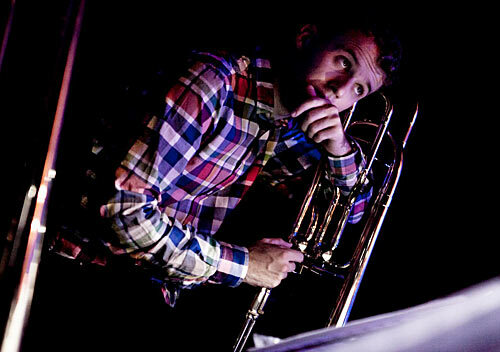 Robinson is a composer, arranger, trombonist and sound artist whose works are not easily categorised. He graduated from West Australian Academy of Performing Arts in 2009. He has received commissions from such jazz and classical ensembles as the Australian Brass Quintet, the WA Youth Jazz Orchestra, Fused and the Arundo Reed Quintet. He has been an arranger for Sinead O’Connor and was commissioned to write for Orchestra Victoria’s Seven Songs to Leave Behind. His music has been performed by the Bennetts Lane Big Band, Canada’s Frontier Justice Big Band and EMO (Enthusiastic Musicians Orchestra). 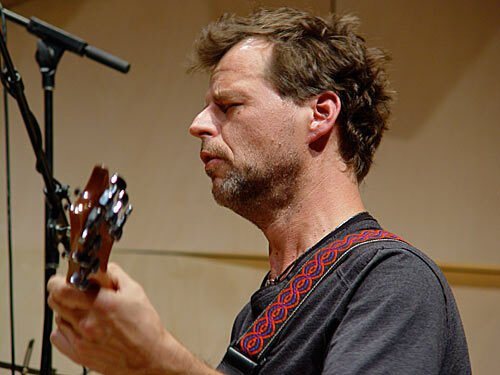 Tolley gave up the bass violin in 2005 because of Parkinson’s Disease, but his recovery was “fed by intensive studio work with computer-generated electronic sounding and sporadic painting and drawing”. Late last year he organised RRaPP — a Reunion Retreat and Performance Project concerned with the “discovery through the process of composing and performing simultaneously, in real-time, interactively, without preconception but drawing upon the vast collective creativity, skill and experience of the protagonists.” This project facilitated Tolley’s return to bass violin. Ren Walters is known to Fringe patrons for, among many other outings, his APRA Commission work performed at Iwaki Auditorium in 2009. 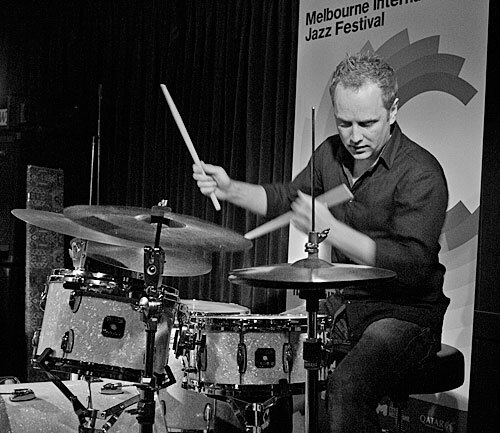 Steve Magnusson in a MJFF festival gig at the Melbourne Recital Centre. MAGNET is a new project for guitarist/composer Stephen Magnusson as a creative collaboration with Ball, Pannuzzo and Argentinian drummer, Sergio Beresovsky, who is in Argentina. Beresovsky’s absence offers the trio version of the group a way to re-interpret their repertoire, as they do every time they perform, starting with simple melodies and building it “from their ears up”. We can expect interaction and harmony at the deepest level of collective improvisation, with “the moments made as pure as if they had been composed over crystal”. Tilman Robinson’s ensemble Network of Lines will perform the the premiere of his commissioned work If on a Winter’s Night a Traveller on Sunday, May 13 at Northcote Town Hall. Robinson’s work attempts to replicate its the structure of Italo Calvino’s 1979 postmodern novel. Employing elements of through-composition and free improvisation, the work aims to present a cohesive musical narrative while allowing the musicians to speak directly to the audience. The line-up for the concert will be Tilman Robinson, composition/trombone/processing; Peter Knight, trumpet/processing; Callum G’Froerer, trumpet; Xani Kolac, violin; Melanie Robinson, cello; Brett Thompson, guitar/banjo; Berish Bilander, piano/accordion; Samuel Pankhurst, double bass; and Hugh Harvey, drums. Opening the gig at 5pm will be David Tolley with Ren Walters, followed by Carl Panuzzo Trio featuring Stephen Magnusson and Eugene Ball.